Ignoring data and worldwide protest, Departments of Health within the U.S. are now sending letters to parents advising them to submit their children to HPV vaccinations. With no prior announcement, parental consent given, or notice, the states of New York and Indiana have tracked HPV vaccine non-compliers and are now hassling them with physical letters. 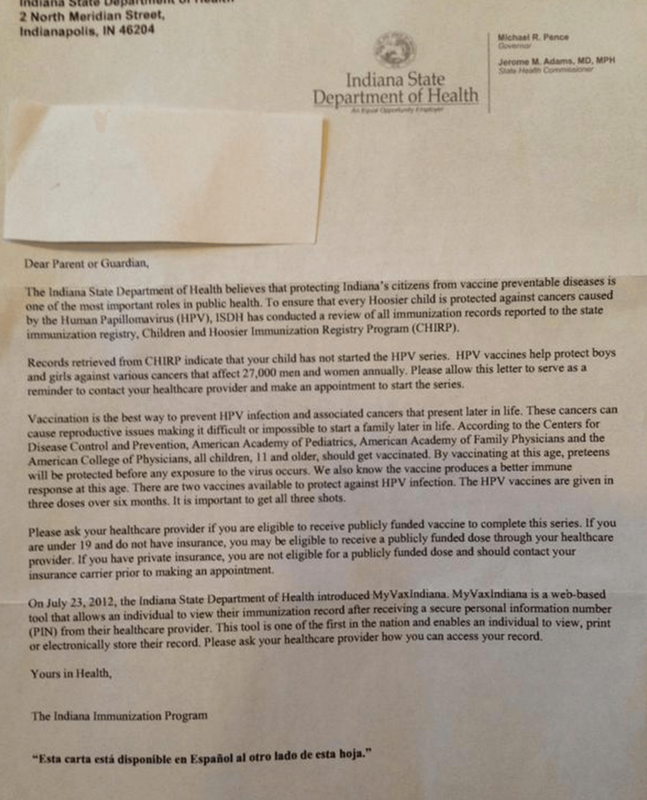 Indiana State Department of Health sent a letter advising parents to submit their children to HPV vaccination. Click to enlarge. 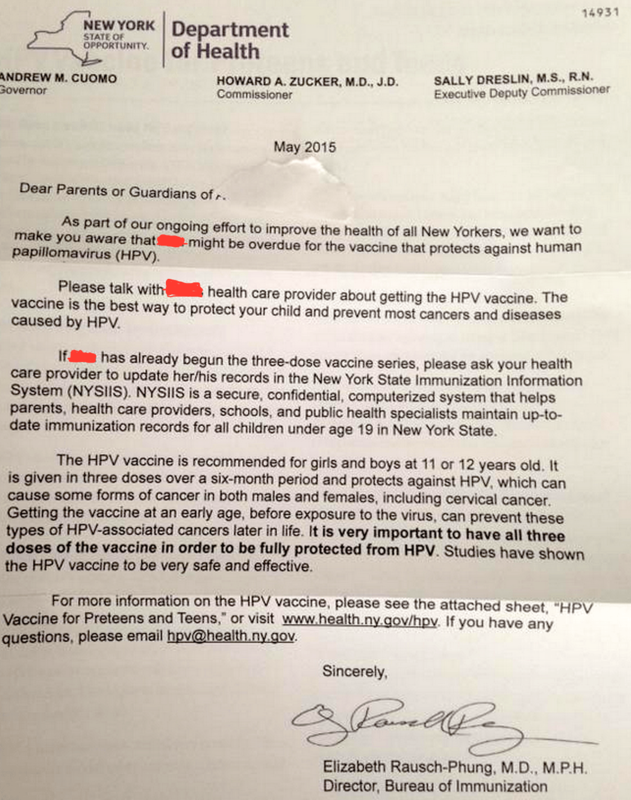 New York Department of Health sent parents a letter advising them to submit their children to HPV vaccination. Click to enlarge. These letters are a concerning step on a slippery slope given the atmosphere of politics and law currently rooting in America surrounding forced vaccination. Words like “court orders, ” Child Protective Services visits, and “immunization registries” have been given as marching orders by policy makers and legal advisors. Meanwhile, the medical rights and the consent of parents has taken a temporary backseat. According to the parents who received the letters pictured in this article, they were not aware of this tracking system and their child’s enrollment in it. Are other parents getting notiﬁcations by mail such as these? If yes, did they consent to having their child’s vaccination compliance tracked? As other countries appear to be making some headway in casting out forced HPV vaccinations from their law books and politician’s minds, the U.S. isn’t so lucky. With the appointment of HPV vaccine developer Douglas R. Lowry to head of the National Cancer Institute,  it appears the religion that is forced vaccination is becoming further imbedded into the country’s medical establishments. To make matters worse, the Federal Government’s Healthy People 2020 initiative is actively working towards a target of 80 percent vaccination rates among males and  females ages 13-15 for the three-dose HPV vaccine series.